One of the most important things that every dog needs is proper training. Of course, hiring a professional dog trainer or ​an ​animal behaviorist can be very expensive. And browsing the training aids in the aisles of a pet supply store may leave you reeling from sticker shock. Not to worry! You don't have to spend a ton of money to have a well-behaved dog. These tips for low-cost dog training will help you train a dog on a budget. Clicker training is a method of positive reinforcement dog training. It involves using a small device called a clicker to let your dog know when he or she does something you like. As soon as you click the clicker to mark the behavior, you give your dog a small dog treat. It's easy to learn how to clicker train a dog, and you can purchase a clicker for under $2 from any dog supply store. There are also a lot of inexpensive options for dog training treats, and since you only use a small treat each time you click, a bag of treats can last awhile. To save even more money on treats, use tiny pieces of homemade unseasoned cooked chicken or turkey during training sessions. Many dog rescues and humane societies offer free or low-cost dog training classes and seminars. Because so many dogs are surrendered to shelters due to behavioral issues, they offer dog training classes as a community resource in the hopes of keeping dogs from being given up by their families. Many shelters also offer behavior helplines, informational handouts on dog training, and on-site dog trainers who can help answer behavior and training questions, all for no charge. While exercise won't cure every dog behavior problem, it can make a big improvement in a number of issues, such as destructive chewing, digging, and ​excessive barking. Every dog needs exercise to expend energy. 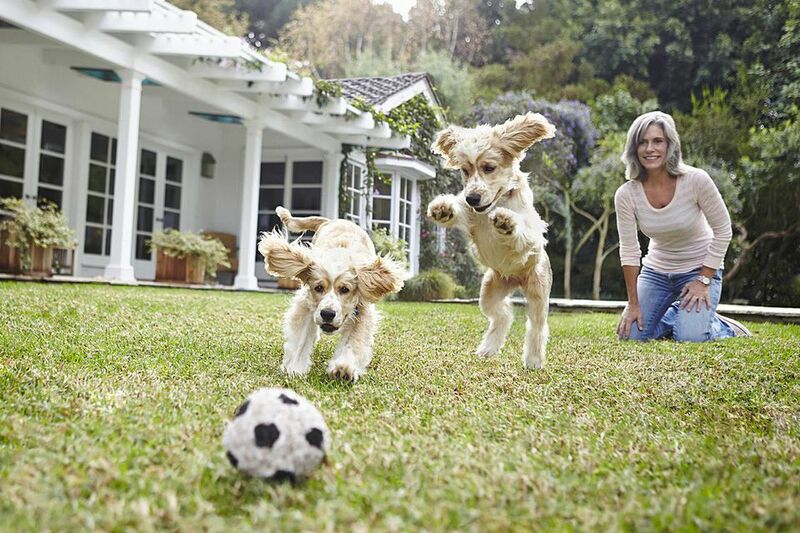 A long walk or a game of fetch is a great way to burn energy and offer your dog some mental stimulation. It can also help an energetic dog focus better during training sessions. Best of all, it's free and has great benefits for the dog owner as well. One of the best ways to learn about dog behavior is to read books by expert dog trainers. A number of dog trainers also have videos which give step-by-step instructions on how to train a dog. Rather than spending a fortune on books and videos, check out your local library. Very often they have a collection of some excellent dog training books and videos, or they can borrow them from another library. Take notes before returning the books and make copies of important pages. A seasoned dog owner or a dog trainer who is just starting their business may be able to help you. A dog lover could offer help out of the goodness of their heart and their love of animals. A dog trainer that is starting out may give you a discounted or free rate for the benefit of their experience and your review. Every new business needs clients and offering a discounted introductory rate is a great way to get new work. A common mistake is to avoid training altogether because of the cost. With these low-cost dog training options, cost concerns can be eliminated but the time and dedication to training are still essential. If you have a rescue dog or highly aggressive dog, it may be worth your while (and the safety of other dogs and humans ) to seek professional help.